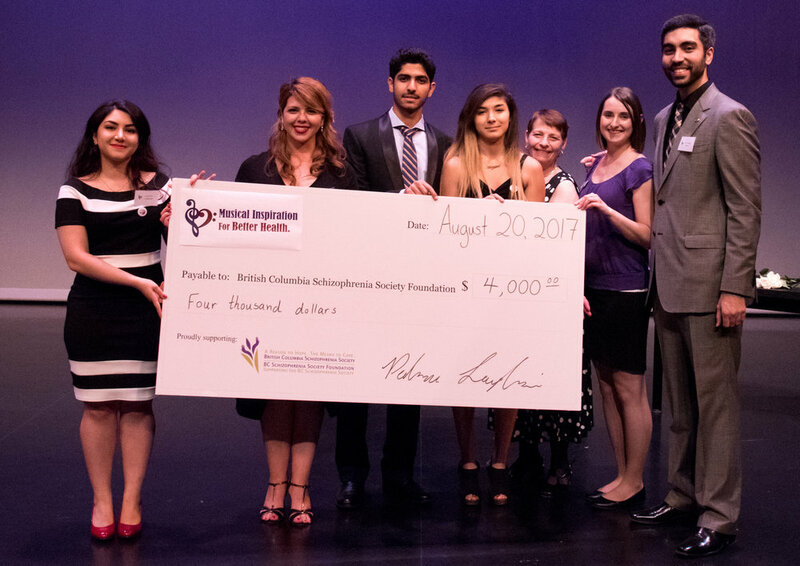 On August 20th, 2017, the Music For The Hearts Organization hosted its 4th annual musical concert at one of the prestigious centres for performing arts in Coquitlam, Evergreen Cultural Centre. In the past, the committee has supported community health by contributing to the purchase of better medical equipment for the improvement of hospital services. This year, the team unanimously agreed to focus on mental health, especially those suffering from schizophrenia, one the most severe forms of mental disorders. Schizophrenia, for the majority, is a life-long, debilitating disease. Despite many years of research, it remains to be complicated. However, it is not to say it is unmanageable. In fact, there are numerous ways affected individuals can get the help they need. BC Schizophrenia Society is a province-wide, non-profit organization that offers extensive, direct support for individuals and families coping with severe mental illness. Our 4th annual event was dedicated to support their cause. This event would not have been possible without talented musicians, generous sponsors, and hardworking volunteers. MFTH Organization thanks Soltani Music School and Westwood Alliance Church Choir Children for dedicating countless hours coordinating their performances. Both these groups have not only helped MFTH 2017, but have graciously supported MFTH through multiple years. Furthermore, MFTH Organization thanks other independent musicians, namely Ghazal Farshchian, Kasra Shahsavari, Davis Song, Parsa Samani, Faraz Nikzad, Mahsa Movahedan, and Liza Cooney. Many thanks to Dr. Maria Gholami, Mrs. Fariba Kaheh and Ms. Ellie Pahlavanpour for providing financial support. MFTH annual concerts are made possible by these charitable groups. Moreover, MFTH Organization sincerely thanks Mr. Fred Soofi, the owner of Pasta Polo & Brick Oven Pizza, Haida Sandwich, Starbucks, Cobs Bread, Thrifty Foods, Menchie’s Frozen Yogurt, Browns Social House at Town Centre, Milestones at Coquitlam, Cineplex Theatres, Zone Bowling Coquitlam, Ashton Lane Hair Company, Coquitlam Grill, and Ninja Bubble Tea for donating delicious assortments of foods, drinks, and door prizes. Our team thanks Joanna Lu, Ali Afsaneh, Seenan Iftekhar, Lynell Adams, Kerr Xiao, Zhina Majdzadeh, Raha Khishkar, Jade Bayzae, Jeremy Corrigan, Jason Kim, Pavel Minnikh, Abhijeet Kamble, and Hiroe Tada for volunteering with us this year. This event welcomed over 200 guests. With the collective efforts of the aforementioned groups, we raised a net amount of $4,000 for BC Schizophrenia Society. The funds have been used to directly support individuals and families coping with schizophrenia, educating the public, improving mental health services, supporting schizophrenia research, and more.